The following is an article published by the Public Opinion’s Weekender Magazine on Thursday, November 14, 1996. 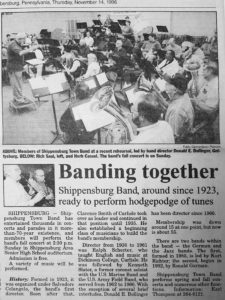 Shippensburg Band, around since 1923, ready to perform hodgepodge of tunes. 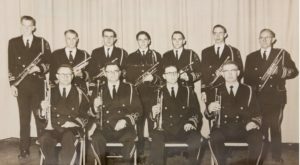 SHIPPENSBURG – Shippensburg Town Band has entertained thousands in concerts and parades in it more-than-70-year existence, and members will perform the band’s fall concert at 2:30 p.m. Sunday in Shippensburg Area Senior High School auditorium. A variety of music will be perform. History: Formed in 1923, it was organized under Salvadore Colangelo, the band’s first director. Soon after that, Clarence Smith of Carlisle took over as leader and continued in that position until 1935. He also establishes a beginning class of musicians to build the band’s membership. Director from 1936 to 1961 was Ralph Schecter, who taught English and music at Dickinson College, Carlisle. 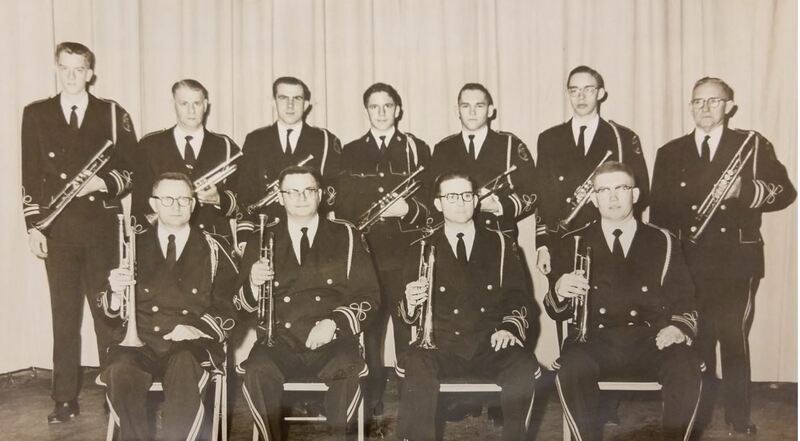 He was followed by Kenneth Slater, a former coronet soloist with the U.S. Marine Band and the U.S. Army Field Band, who served from 1962 to 1966. With the exception of several brief interludes, Donald E. Bollinger has been director since 1966. Membership was down around 15 at one point, but now is about 55. There are two bands with the band — the German and the Jazz Bands. The first, formed in 1985, is led by Kurt Richter, the second, begun in 1992, by Ronald Garman. Shippensburg Town Band performs spring and fall concerts and numerous other functions Information: Karl Thompson at 264-6121. NEW! Below is a collection of excerpts from William H. Burkhart’s book, “Shippensburg’s 250-Year History” published on the occasion of Shippensburg’s 250th Anniversary program, July 6-19, 1980. On Nov. 16, 1837, a train of seven cars drawn by two locomotives, the “Cumberland Valley” and the “Carlisle,” left the Susquehanna between 10:00 and 11:00 a.m. and arrived at Chambersburg at 3:00 p.m.